Welcome to this edition of the Real Fast Results podcast! John Kremer is today’s special guest. Essentially, he’s an expert on book publishing and marketing. In fact, he’s the author of what some people would consider the bible of the book marketing industry, which is 1001 Ways to Market Your Books. He’s also the primary lead instructor for the course 1001 Ways Masterclass. John has helped a lot of people to be successful. Stephen Covey, who wrote 7 Habits of Highly Effective People, is just one example. Stephen actually said that Kremer was instrumental to this book becoming one of the most influential business books of the 20th century. Jack Canfield and Mark Victor Hansen are also big fans of John’s work. As a matter of fact, Jack actually said that if you wanted to sell 600,000,000 books like they had, with the Chicken Soup for the Soul series, you should read and use John’s book. We are going to show people how to become experts in their topic and promote that expertise over and over again. We are going to do this by showing how to develop a very simple technique. I call it my “5 Way Technique”. Simply, you come up with five ways to do something, to be something. Five recommended blah, blah, blahs. Something like that. It’s really easy, and you can do this in a couple of minutes. It doesn’t matter what kind of book you have written. You can come up with something quickly. 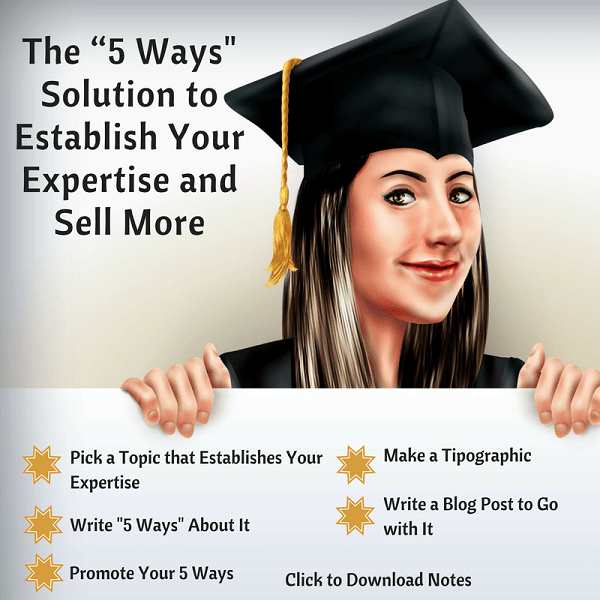 You create a tipographic and a blog post that goes with it. You might do a podcast. If you are interested in checking out the on-demand webinar for 1001 Ways Masterclass, you can head over to 1001WaysMasterclass.com. You can jump in and pick a time and date to watch the on-demand webinar. That’s one way for you to reach out and connect. If you want to connect with me, I would rather you come to my BookMarketingBestsellers.com website. That’s my active website. I have a legacy website, but BookMarketingBestsellers.com is my active site. You can easily connect with me there, and there’s tons of information on that website for you to take advantage of. And, of course, I would like you to go out and buy 1001 Ways to Market Your Books at Amazon, or in your favorite bookstore.